Little teasers to showcase upcoming act, act ideas, costumes and props. This act shall be a sultry classic act! as these days classic is my favourite genre of performance. I'm thinking lots of water a little sparkle and a lot of rhinestoned underwear!! Watch out for this act! Not complete yet but it's slowly, slowly getting there. 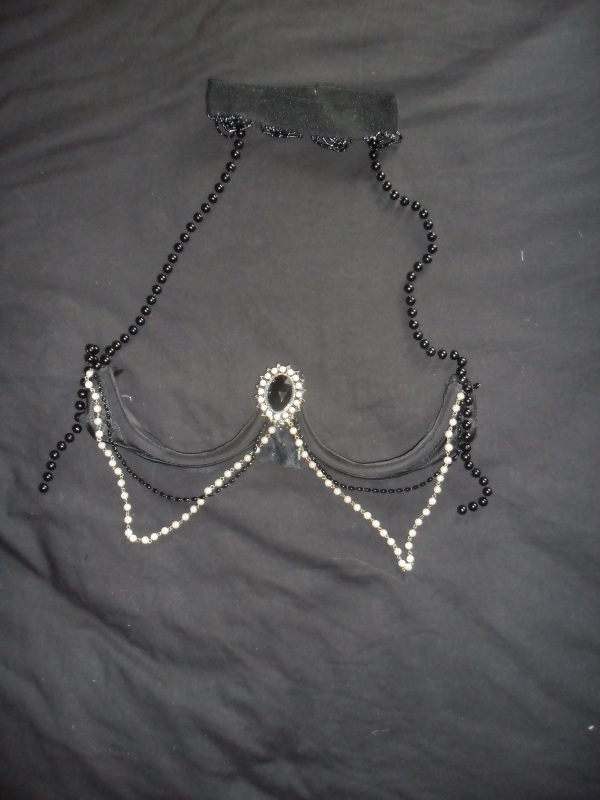 I need to get down to the rag market and buy me some beaded fringing!! and go get a pack or two of balloons. I'm really excited about his act to have its debut at BCB 4th of June. 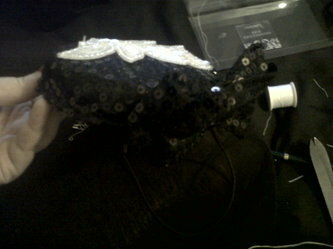 Almost finished and completed balloon pop costume for tomorrow night!!! 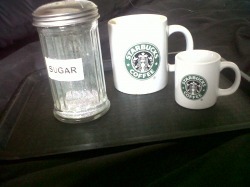 I'd really like to do a starbucks coffee based act so I've been a bit of a cleptomaniac collecting things from Starbucks so far ... sugar shaker [i feel glitter could work in this], tray, a couple of cups ..... now i need a few straws, I'd really like one of those fancy starbucks trays that have the logo on and 'try me!' and most importantly a starbucks appron!!! HELP! a burly girl out. keep you posted on how this act evolves. 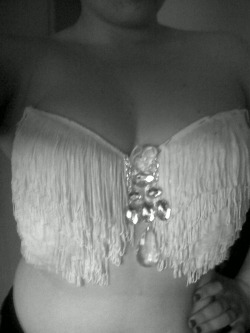 I went a little fringing mad! I went a little crazy with the rhinestones :D!! Before moving house I started rhinestoning some plain black one strap heels and a top hat for my showgirlesque routine using the song Oner fron Chorus line - I wanted to debut this act at BCB's last newbie show but didn't get the track in time so fingers crossed it'll be featured at a BCB event soon! 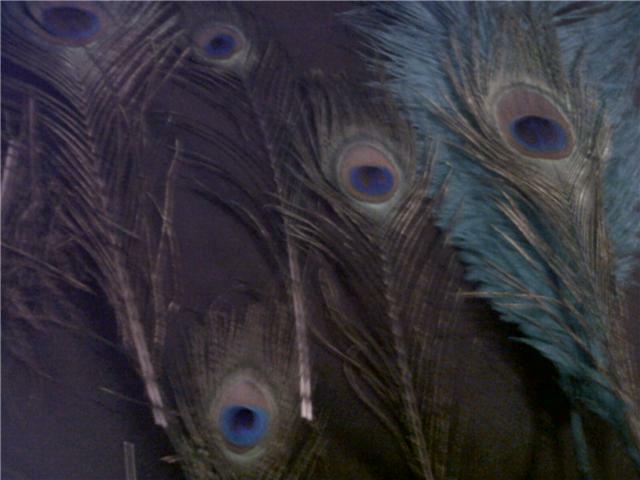 I shall be using my showgirl satin and net all in one leotard with fringed sleeves and sequin embroidery on the front. I'm rather excited as I've been trying to practice the opening choreography for the song, lots of practicing still to go I think!! This is what I'm hoping shall be my biggest act to date! I am putting together two classic Jazz pieces of music to create a 6 minute spectacular strip tease emphasis on the tease! lots of classic glove work with a little bump and grind! Hopefully to be debuted in September!! 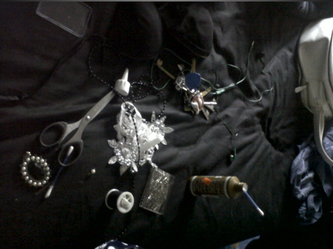 The costume is currently under way with my lovely friend Miss. 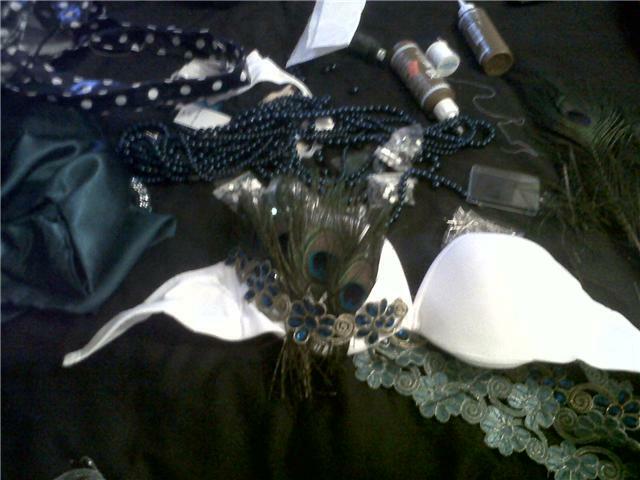 Hannah putting together my dress while I work on making and embelishing my bra and thong! Still yet to find the perfect colour/style corset yet but that'll all come in time! hopefully I'll get a picture teaser up soon guys and dolls. edit// i managed to finally get a photo up guys and dolls. thank you to a friend of mine who posted the title of this song on my facebook page!! it's the music I was looking for and hope to use for purple haze in the new year!! 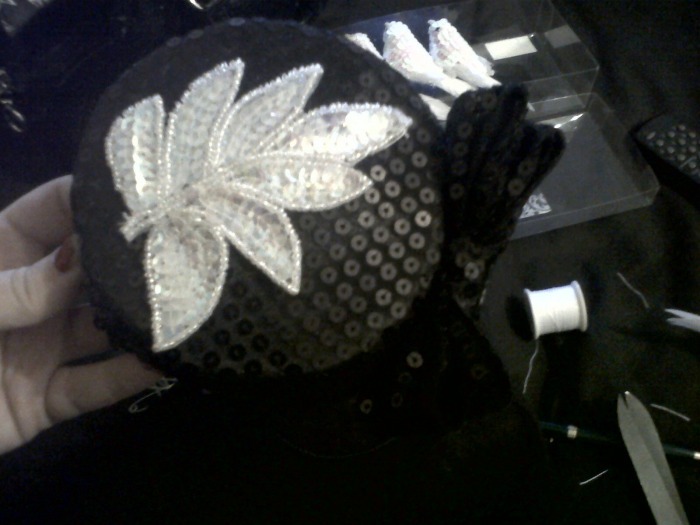 As I couldn't make a last minute show Monday night I spent my time taking apart my bustle from my balloon pop and remaking it, putting together a new fascinator and adding rhinestones to my mini top hat from 'Gentlemen Prefer Blondes' making a little V in crystal stones. 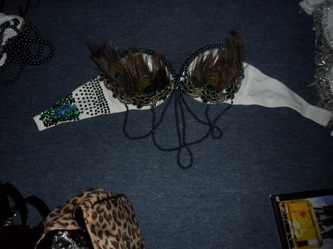 I still have a few more things to go I need to finish off my bra for 'Emerlad City' and then move on to the thong. I also need to get a new printed badge to go on my Diner costume and find someone to print on the back of it. Any idea [not online] where I can find a pair of 50's cat eye glasses .... not sun glasses? 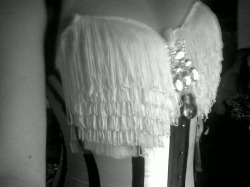 So the last week and a hald I decided to put together a new costume and routine. Originally it started as scribblings for a fan dance as I thought it'd be nice to do something rather traditional but insteas as I'm terrible broke I came up with a silk scarf dance instead. The costume is based on a beautiful bra I saw years ago in Agent Provocateur. 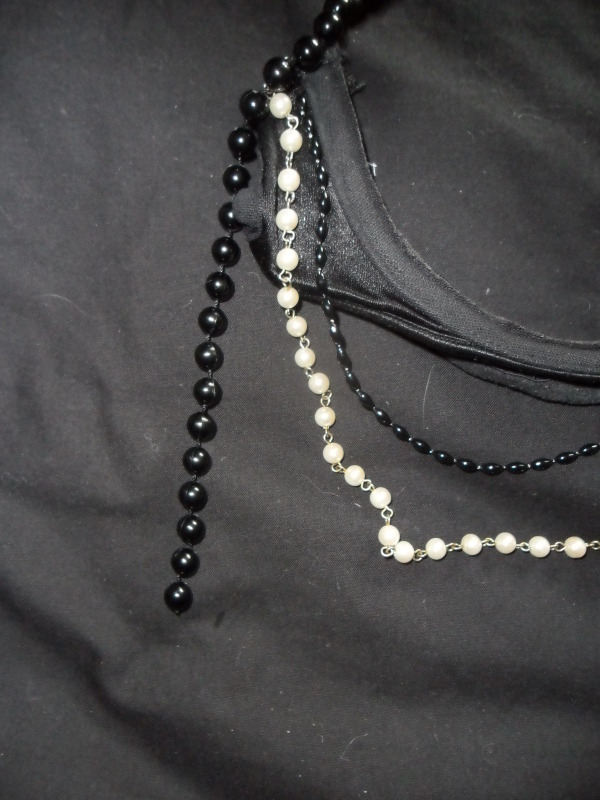 I took a black bra I don't wear often [I did a clear out of underwear 3 weeks ago and let's just say I have farrrrr to much] I cut out the cups and using black thread did a bit of sewing to give it a clean edge. 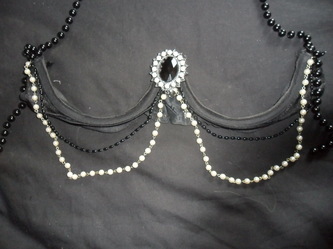 I then got some meters of pearl beads and black beads and attached them to the bra to drape down. 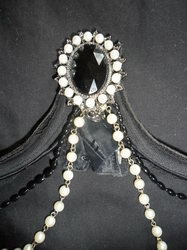 Following that I attached a pearl, black and antique silver pendant in the centre. 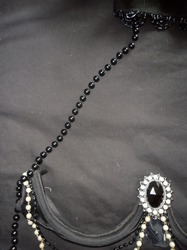 After having a practice with the bra on I realised that it didn't stay up properly so originally I created a chocker that I edged with beading and attached ribbon to it and then to the bra [sadly the ribbon wasn't strong enough and began to wear during practice] I unpicked the ribbon and attached black beads to join which seemed to hold up and not only that but look a lot better. 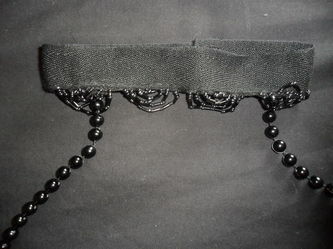 For the bottom half I attached the pearl and black beading to the thong at different levels along with some of the bead trim from the chocker. 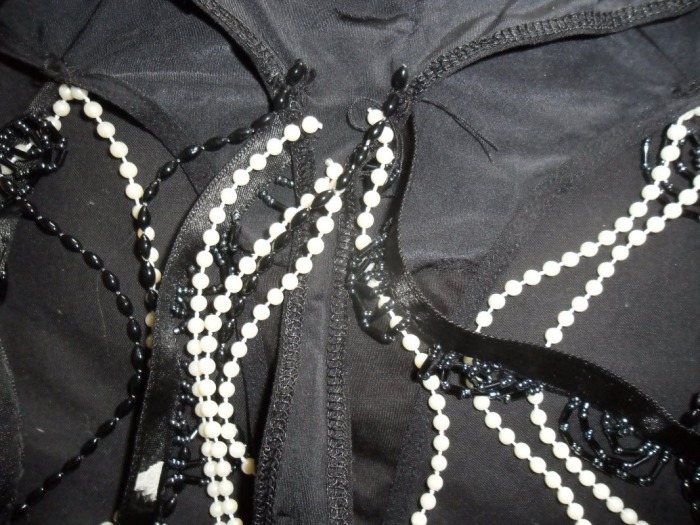 I then got my silk scarfs in white and overlocked the edges [by hand] which tuck in the front and back of the thong before they are pulled out to use. 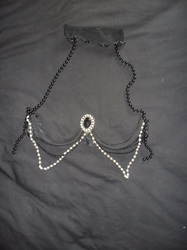 Now just to create a beautiful headpiece trimmed with the same beads. I feel the pants need a little work but I'll have a play around and see what happens. I've been revamping my classic strip tease as you can't go wrong with a classic strip and finally have settled on a new song. enjoy. 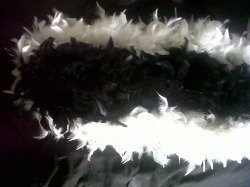 While at erotica I finally purchased some beautiful black feather fans names Bettie Davies and Mae West, I did want grey but they only had one grey and I really had my heart set on a matching pair so I went for black - never gets old and will never go out of fashion now I just need my wonderful Hannah Banana to make me a bag for them to match my lovely bag for my what katie did corset. I have also decided the costume I made months ago [posted above black cut out cups with black beading and pearl drop] shall be used as my costume for this act with a few added treats. 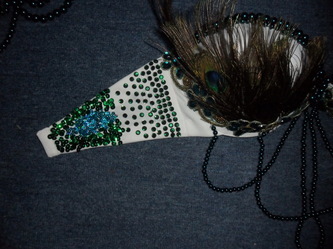 I also finally after moving house and sorting a few things out managed to get round to taking a picture fo the first fascinator and pasties I've ever made which were for my Emerald City act. I thought I'd add a little teaser about my new project that is slowly underway! 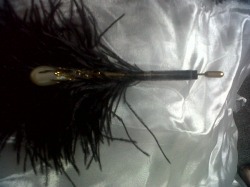 I shall be needing local burly girls, ladies who own burly companies and kittens who just like a bit of burlesque! For one of my brand new acts!! Bad Taste Barbie .... watch out!! My act to be debut at The Blue Room in Northampton on the 17th April!! 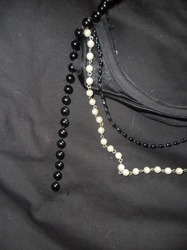 Below are two image from parts of the costume!! 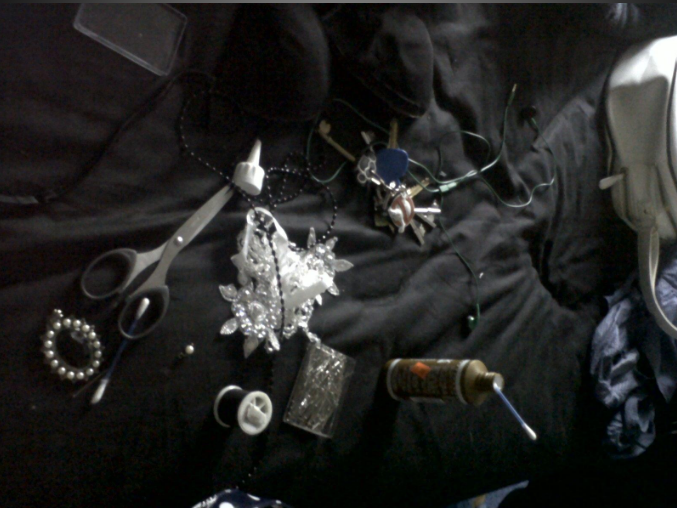 its a work in progress! !